Interference Archive | What powers Interference Archive: volunteers! 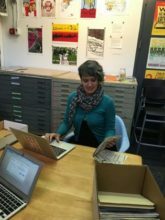 What powers Interference Archive: volunteers! This post is number twelve in a series during the month of December 2016, where we are reflecting on the things — issues, movements, and ideas — that give us a reason for existing here at Interference Archive. We wanted to take this time to think about what these critical elements and movements bring to us, and what we have to give to them. You can read parts one, two, three, four, five, six, seven, eight, nine, ten, and eleven as well. Interference Archive is run entirely by volunteers. As a community doing work together, this creates an amazing space for us to learn, grow, and try our hand at new things we’re interested in. There are at least forty people involved on a regular basis — weekly or monthly, in person or not — in some aspect of the work we do. Earlier this year, a few of us took time to share on this blog what our volunteering experience has been like. Chris Moyer wrote about his introduction to our volunteer structure, and helping out with various events as well as exhibition setup. 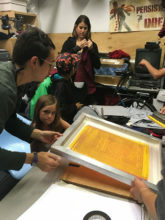 Mobile Print Power, who collaborated on our summer 2016 exhibition, reflected on their own principles for working together and being part of their community. 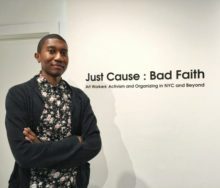 Rob Smith described his wide-ranging volunteer work, from co-curating the Just Cause : Bad Faith exhibition, to taxonomy building and podcast making. Michele Hardesty started our regular cataloging parties, for which we are super grateful (send us an email if you’d like to get involved!). Louise Barry reflected on her volunteer experiences that led her to start our Audio Working Group. If you’d like to get involved as a volunteer, please send us an email! You can reach us at info@interferencearchive.org.